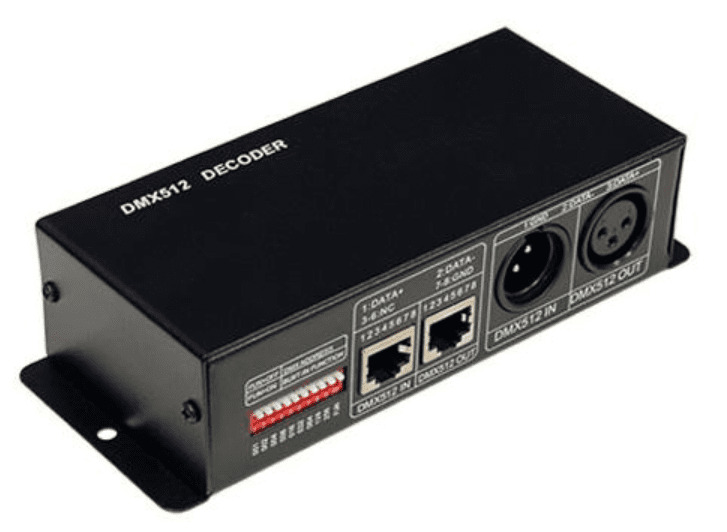 This is a 4-channel DMX512 decoder that can control up to 4 different 12V LED ribbon products or any one RGB(W) LED strip. It can run in stand-alone mode by via the DIP switches or under DMX512 control using XLR or RJ45 DMX512 Input/Output connections. It converts DMX signal to PWM signal, which can be controlled by a DMX512 console with 256-grayscale levels per channel. It also includes one male, and one female 3-pin XLR connector.